For the first time, scientists have observed ripples in the fabric of spacetime called gravitational waves, arriving at Earth from a cataclysmic event in the distant universe. This confirms a major prediction of Albert Einstein’s 1915 general theory of relativity and opens an unprecedented new window onto the cosmos. Based on the observed signals, LIGO scientists estimate that the black holes for this event were about 29 and 36 times the mass of the sun, and the event took place 1.3 billion years ago. About 3 times the mass of the sun was converted into gravitational waves in a fraction of a second — with a peak power output about 50 times that of the whole visible universe. By looking at the time of arrival of the signals — the detector in Livingston recorded the event 7 milliseconds before the detector in Hanford — scientists can say that the source was located in the Southern Hemisphere. 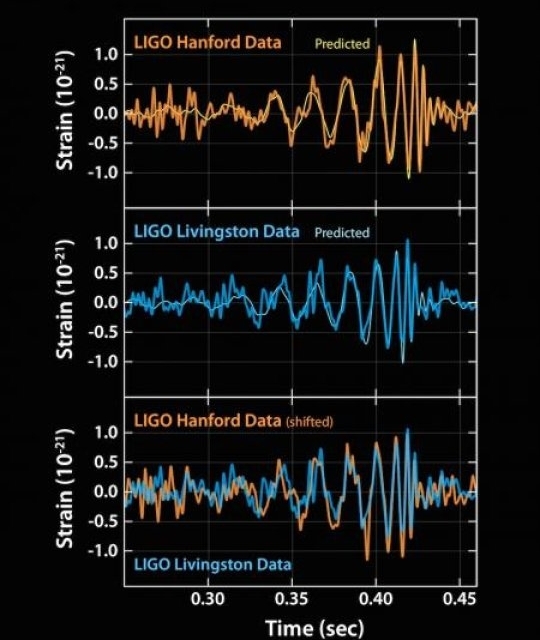 The new LIGO discovery is the first observation of gravitational waves themselves, made by measuring the tiny disturbances the waves make to space and time as they pass through Earth. 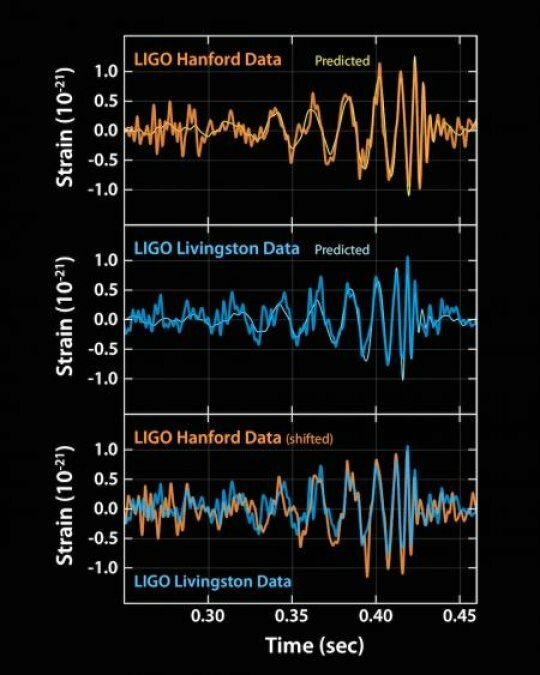 The discovery was made possible by the enhanced capabilities of Advanced LIGO, a major upgrade that increases the sensitivity of the instruments compared to the first generation LIGO detectors, enabling a large increase in the volume of the universe probed — and the discovery of gravitational waves during its first observation run. The US National Science Foundation leads in financial support for Advanced LIGO. Funding organizations in Germany (Max Planck Society), the U.K. (Science and Technology Facilities Council, STFC) and Australia (Australian Research Council) also have made significant commitments to the project. Several of the key technologies that made Advanced LIGO so much more sensitive have been developed and tested by the German UK GEO collaboration. Significant computer resources have been contributed by the AEI Hannover Atlas Cluster, the LIGO Laboratory, Syracuse University, and the University of Wisconsin- Milwaukee. Several universities designed, built, and tested key components for Advanced LIGO: The Australian National University, the University of Adelaide, the University of Florida, Stanford University, Columbia University of the City of New York, and Louisiana State University. “With this discovery, we humans are embarking on a marvelous new quest: the quest to explore the warped side of the universe — objects and phenomena that are made from warped spacetime. Colliding black holes and gravitational waves are our first beautiful examples,” says Thorne. “To make this fantastic milestone possible took a global collaboration of scientists — laser and suspension technology developed for our GEO600 detector was used to help make Advanced LIGO the most sophisticated gravitational wave detector ever created,” says Sheila Rowan, professor of physics and astronomy at the University of Glasgow.